Made of 3 sections approximately 29” long and connected by an internal elastic band for great portability and very quick and easy assembly in the field, it extends to 8 feet high and is designed to display both static decoys and the MOJO Voodoo Dove. 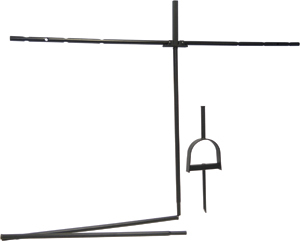 • MIMIC AN ENTIRE FLOCK OF DOVES: Foldable cross arms that hold up to 6 static decoys. These Flambeau 11" Crow decoys can be hung in trees or attached to branches or posts with the built in mounting system. Packed 12 per box. Soft, lightweight polyethylene foam. Comes with clip attachment for easy setup. 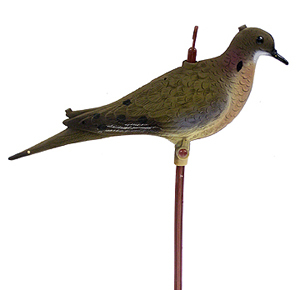 Sport-Plast has always been a leaderin dove decoys, variety is their specialty. These silhouette decoys are very compact yet look very real. These decoys measure 10 1/2" from tail to beak and the stake measures 11". Sport-Plast has always been a leaderin dove decoys, variety is their specialty. 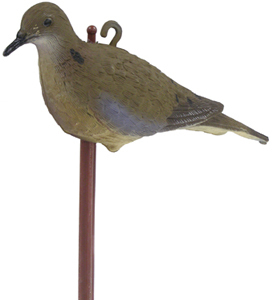 These Full Body Dove decoy is very real looking, with a lot of great features such as a stake that will allow the decoy to move in the wind. These decoys measure 11" from tail to beak and stake measures 12". These decoys can also be hung in trees. 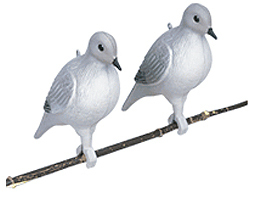 Sport-Plast has always been a leaderin dove decoys, variety is their specialty. These Flying decoys are very real looking, and give a spread a different look. They also look good in the lodge or in the garden. These decoys measure 11" from tail to beak and the wind span measures 17".